Cloth Doll Challenge - 2019 Cloth Baby and Child Doll Challenge - Cloth Baby Dolls! saying "I am Joining the Challenge!" Include your name, which challenge (baby, child or both) and your skill level. Doll designer, author, teacher and supply business owner from the United Kingdom. Cloth doll designer, teacher and 11 year sponsor! 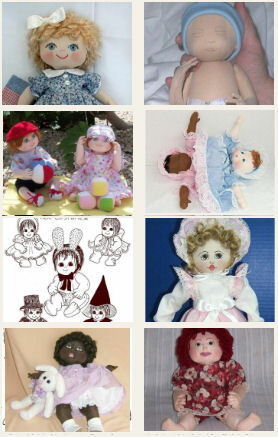 Profesional doll artist featuring traditional, primitive, country and fun designs. Cloth doll artist from New Zealand featuring unique designs and educational tutorials. Professional designer with endless creativity! Cloth & Mixed Media Artist with designs that include a little of everything! Winners for each challenge and skill level will be determined from a split of 50% of the votes from online voting by other dollmakers and 50% of votes from our panel of professional doll designers! Take a Look at Dolls From the Last 10 Years! Need Patterns/Help For the Challenge? #1 Sponsor for the 11th Year! Click GO For Available Patterns! and More - go HERE! Founder and 11 Year Sponsor! 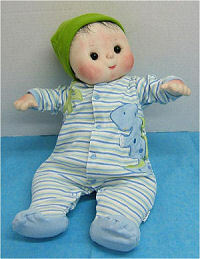 Baby Doll Patterns by Judi Ward, Kezi Matthews, Sandra Blake,Colette Wolff and More! Please subscribe to the Doll Net Update below! Sponsored by Dollmaker's Journey, Cloth Doll Market, Judi's Dolls, Cloth Doll Connection, Platypusnow, Sandra Blake Designs, Magic Threads, Inner Child Creations and The Doll Net! No matter what type of cloth dolls you enjoy making, or if you are a quilter or do other sewing/craft projects, it is always fun to go back to the basics and make a Baby Doll! Everyone likes babies and baby dolls! 2019 includes a Second Challenge! So come join in the fun and win some prizes! You may enter up to 4 dolls. 2 in the Baby Challenge and 2 in the Child Challenge! Below are the challenge information and rules. Beginner... A Beginner has made one or a few (6 or less) cloth dolls, and has many techniques to master. Has not sold dolls, but does give them as gifts. Intermediate... An Intermediate dollmaker has many more skills under their belt, needs work in perhaps a few areas, an has possibly sold a few dolls. Often gives dolls as gifts. Advanced... An Advanced dollmaker has made many cloth dolls, perhaps sells many and also usually designs (amateur or professional). Almost all skills that they need are mastered, and any new skills are easy to master. The Beginners level should be just that.. a beginner dollmaker. This is a level where beginning dollmakers have a chance to push themselves and show off their newly found creative skills. If you are a beginner "Designer" you should be in a higher level category. Beginners have not sold any dolls. The Intermediate level will be the largest group and also the most diverse group. And the Advanced level is for the advanced dollmaker and/or designer! It is a great challenge and honor to enter your doll in this category. Winners for each challenge and skill level will be determined from a split of 50% of the votes from online voting by other dollmakers and 50% of votes from a panel of professional doll designers! 1st.. $50 Dollmaker's Journey Gift Certificate (Click HERE to Visit Site)! 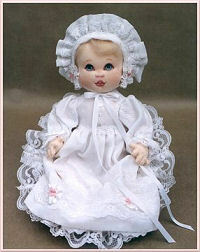 2nd.. $30 Cloth Doll Market Gift Certificate (Click HERE to Visit Site). 3rd.. $20 Judi's Dolls Gift Certificate (Click HERE to Visit Site). *** Note... You may enter up to 4 dolls. 2 in the Baby Challenge and 2 in the Child Challenge! The doll may be from a pattern or made from your own original design. Also, the Doll must be made for this challenge and have never been entered in any other competition. Do not post the doll anywhere online until the challenge is over. The voting is based on anonymous entries. Important Note... If your doll is an original, please indicate this in the description. If it is from a pattern, whether "tweaked" or not, list the designer's name and pattern name as well. The doll may have supporting accessories either made or purchased (i.e. toys, stuffed animal, etc.) Please indicate in your description if the accessories are made or purchased. A maximum of 2 entries per dollmaker is allowed in each Challenge. 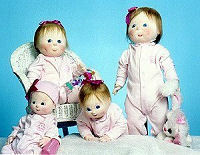 So you may enter 4 dolls... 2 Baby Dolls and 2 Child Dolls. 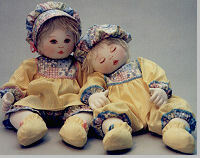 Send a short note indicating you are going to enter and your skill level along with your e-mail address to us letting us know you will be making a doll. E-Mail entry information to dollchallenge@gmail.com. This way we can contact you with any updates. Next, make your doll/dolls! Have fun and be as creative as you wish! 1) 3 photos of their entry. NOTE: Please take the best photos possible and include 3 different pictures... Ideas for pictures... Front Shot, Side Shot, Back Shot, Close-up of Face, Close up of other feature, etc. Please remember... the photos are what everyone votes on so make sure they are clear and representative of the doll and anything special on the doll. This should be a description of the actual doll which includes the designer's name (yourself or designer of pattern), anything special you did in making the doll, info on clothing (home made or from pattern or purchased) and similar information about any supporting items. This may include a short story, quote, history or anything you feel will help define or explain your entry. This will be display along with description. *** Important NOTE... The Description and Additional Information must be a combined 200 words or less. You may split the words between the description and additional information whichever way you wish. You may double check your word count by using the online program we use to verify the number of words - Click HERE. SEND #1 - #5 to dollchallenge@gmail.com on or before June 15th, 2019! - Doll may be any size! - This is the first challenge for the Doll. The doll must not have been entered in any other challenge or competition and must be made for this challenge. - Doll Net is a family friendly site so doll must have private parts covered/clothed. - Doll must be made for this challenge and never entered in another challenge or contest. The Entered Pictures will be posted on the web several days after the closing date without the dollmakers name for a short time period. During this time visitors will be able to vote for their favorite doll in each category. The judges will also be voting at this time. Winners will be announced several days after voting is concluded. Time is needed to count votes and update webpages. To join the challenge please send a short note and your skill level along with your e-mail address to dollchallenge@gmail.com This way we can contact you with any updates.